We are perfectly located in the heart of Surry Hills, 10 minutes walking distance from Central Station. We pride ourselves on providing you with extremely clean rooms with good security. If you are looking for a good night's sleep, comfortable rooms with fresh linen and towels provided, own little basic kitchenette to self-cater, remote TV, and free internet in the common areas, then try us. 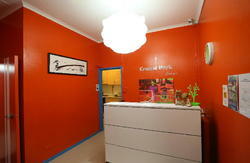 We only have rooms that cater for a two person mixed dorm style room and single rooms. The aim of Sinclair's of Surry Hills is to please those who place priority on clean, secure accommodation at an affordable price. We are close to shops and restaurants, and wonderfully located for Sydney's most famous festivals and night club circuit. Public transport is readily available, and both the airport and our wonderful Harbour are within easy reach, using either bus or train. Sinclair's of Surry Hills Budget Accommodation is ideally set up for budget conscious singles or couples, and the odd lucky traveller that is happy to share a room with only one other person. The hostel is closed at 10.00pm daily, opens again at 7.00am daily. Please conclude your business between these hours. What a great location to explore the city. Oxford Street ten minutes walk. Central Train Station ten minute walk. Rocks and the City, Bus 302.